Research, at least my research, has never been linear. I have found that my lab and I often double back on problems after years of inactivity or go off in entirely new directions as dictated by the work and people’s interests. This lack of direction results, at least in part, from the fact that I am a geneticist and mutants have an annoying, yet wonderful, habit of leading one into new areas of study. 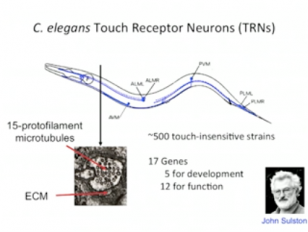 I will describe how a simple assay to look for mutants in the nematode Caenorhabditis elegans that are insensitive to touch (stroking animals with an eyebrow hair glued to a toothpick) led me and my lab to investigate problems in cell determination, cell differentiation, mechanosensory transduction and modulation, and neural circuitry and the integration of sensory signals. Along the way, these studies resulted in the introduction of Green Fluorescent Protein (GFP) as a biological marker, several other methods, and maybe even some insights into a few human diseases. Although we actually have answered some of the questions we set out to study, the excursions far from what I thought I was studying have often been the most exciting.